The OS1540 Series has been superseded, please see the OS4000 Series as a possible substitute or consult OMEGA's Temperature Engineering department. The OS1542 and OS1543 fiber optic sensors are designed specifically for the DP1541 two-color emissivity-independent monitor and the associated fiber optic cable assembly. The small size of these probes makes them well suited for installations with limited mounting room. They are unaffected by RFI and EMI noise, which also make them excellent for use in hostile environments like induction or microwave heating. The OS1542 and OS1543 fiber optic sensors operate at two wavebands and utilize an energy ratio to calculate temperature. They can, therefore, measure temperature on objects whose emissivity is unknown provided the emissivity at all temperatures is proportional at the two wavebands used for the measurement, which is typical. The OS1542 fiber optic sensor head has a silicon detector filtered at narrow bands centered at 0.90 and 1.06 microns; it is used primarily at high temperatures and is minimally affected by steam and hot gas. The OS1543 fiber optic sensor head has a lead sulfide detector filtered over wide bands centered at 1.55 and 2.25 microns. 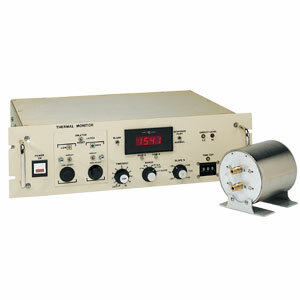 It is used as a general purpose head which can measure temperatures down to 250°C. It should not be used where hot steam or gas is present. The fiber optic cable assembly differs according to certain parameters specific to the application. It allows remote mounting of the OS1542 or OS1543 detector heads away from hot or hazardous areas. Single channel 19" rackmount two-color monitor, slope control, 1 mV/ degree output, 3 3 /4 digit display. (For use with OS1542 or OS1543 sensors.) Analog Output for 1 mV/°C. Optical Sensor 1050-1800°C (1925-3270°F) Spot Size @ Focal Dist. 1.2" @ 36" 4ft. Cable Length. Optical Sensor 980-1650°C (1850-3000°F) Spot Size @ Focal Dist. 0.18" @ 14", 4ft. Cable Length. Optical Sensor 450-850°C (847-1562°F), Spot Size @ Focal Dist. (0.076" @ 6"), Cable Length 4 ft.
참고: Each unit supplied with complete operator’s manual. Consult OMEGA for information on many other controller configurations.